This story has been kindly donated by Bromham historian Dennis Powney, whose book (‘Their name liveth for ever more’) remembers Wiltshire men who fought in the Great War. All copyright is owned by Dennis Powney. This is a copy of the original radio message that was received by my father, William F Powney, who was stationed in Palestine at the time. It is timed and dated 1858 hrs 11th November 1918 (the day that the Great War finally ended). It reads – “Following from GHQ Wireless message from Malta begins. 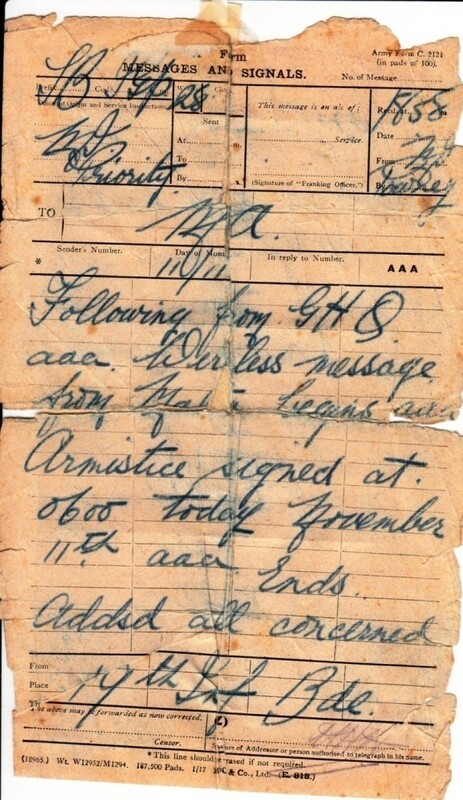 Armistice signed at 0600 today November Ends Addsd (Advised) all concerned”. “17th Infantry Brigade”. Father kept the original copies of both messages; and he always claimed that he was the first in the area to know that the war had finally ended. 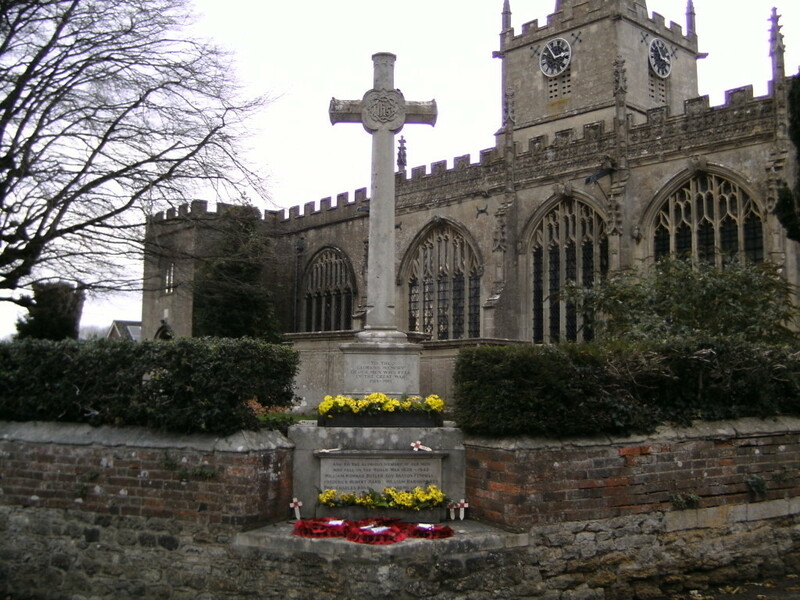 Many of us are familiar with the war memorials to be seen in our villages commemorating local men who fell in the two world wars of the twentieth century, but particularly in the Great War of 1914-18, whom we recall on Remembrance Day each year. In this book, Bromham resident Dennis Powney recalls the 68 men from the village and its neighbourhood who made the ultimate sacrifice. They came from a variety of backgrounds and served in different parts of the world. The majority, however, were young men who had been employed as labourers, cowmen and the like on local farms but who volunteered to go to the front to serve their country in its hour of need. Recorded here are men from the parish of Bromham, the parish of Chittoe, the nearby hamlets of Sandridge Lane and Sandy Lane. Most, but not all, are listed on the war memorials of Bromham, Chittoe, Sandy Lane and Sandridge Lane. Yet some are absent from the local memorials, perhaps because they had left the area, because they had married and lived out of the parish or for other such reasons. They are, nevertheless, fully recorded in this book. Dennis Powney’s meticulous research regarding each of the men – where they lived, what their occupation was prior to enlistment and details of their wider families – will indeed ensure that, for each of them, ‘Their name liveth for ever more’. – Roger Jones. Published by ELSP in association with Bromham Parish Council. 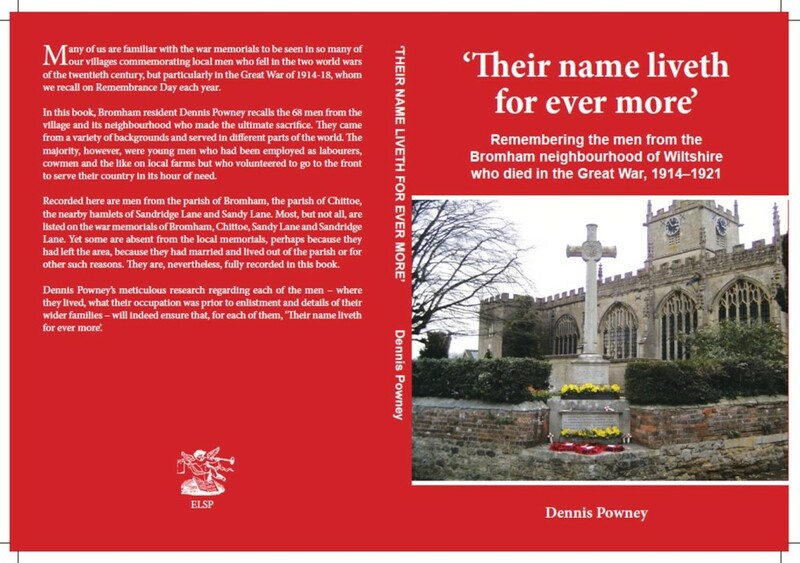 Dennis Powney will be selling his book which tells the storey of 68 men from the Bromham Wiltshire neighbourhood that died in the Great War (WW1).